Who are MU you may be wondering? Yes indeedee, I ask that myself too. Does anyone remember the magazine Strange Things Are Happening? Surely an oasis of shimmering truth in the wind-swept landfill that was the 1980s. Dedicated to the more obscure and eclectic 60s & 70s outfits, it was I think many peoples first exposure to gems such as Skip Spence and Insect Trust, as well as the more mysterious Krautrock and various off the radar genres. In fact, come to think of it Mojo basically ripped off the whole format (add 70% insidious corporate gloss & crap biz obviously). I think it only lasted a few issues, half a dozen or so maybe. Whatever, MU were just the kind of band Strange Things waxed lyrical for. If I had the energy I would tread the stairs to my loft and dig out the magazine in question and find the feature on the band so I could fill in a little background, but to be honest right now I can’t be arsed - way too much dirt & dust. I do however remember reading the album was originally released to relative obscurity in 1971 and featured a member of Captain Beefheart's crew, Jeff Cotton, and Merrell Fankhauser from HMS Bounty, whose late-60s lone pop-sike album I have and is pretty good (in a Strawberry Alarm Clock kinda way). You could say that musically MU was very much a product of Fankhauser’s pop sensibilities meshed with Cotton’s Avante-Blues Approach. It really does conjure up a unique atmosphere and invents a kind of dreamy & progressive cosmic blues, which is very serene and quite unlike anything of the period. Tracks stretch out into an undisturbed and structured groove, always held down by Randy Wimer’s percussion - which reminds these ears of Jaki Liebezeit - and Larry Willey’s genius bass playing, which is so big and warm it’s like taking a bath. Though Cotton's guitar playing is bluesy, he never solos or descends into bar-room boogie heroics or dodgy soloing, which lets face it, for West-Coast 1971 is saying something. Layered on top of all this is Fankhauser’s seriously cosmic lyrics which are so blissed-out as to make the Dalai Lama look sinister. 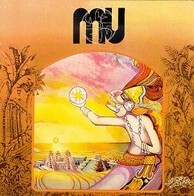 I seem to recall the band lived on an isolated Hawaiian island, researching a vanished civilisation (the MU of the title?). Makes sense anyway, an album this beautiful has no place in the grubby shenanigans of this world.